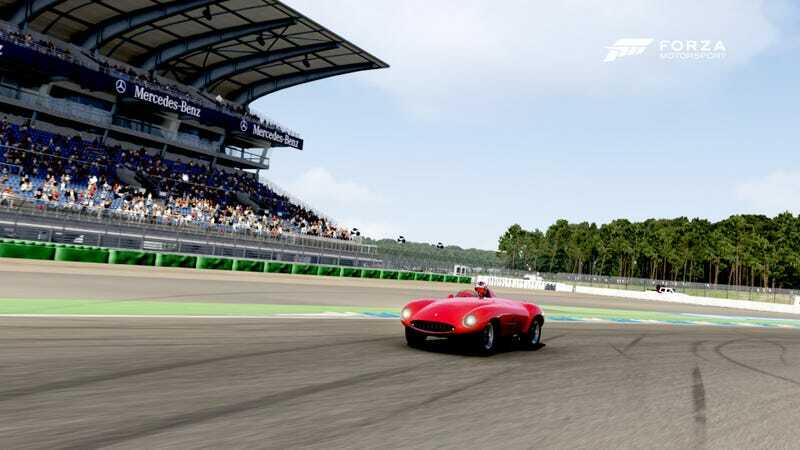 We now head north across the border and into Hockenheim, Germany to race at the world-famous Hockenheimring. Hockenheimring was first built in 1932 as an alternative circuit to the Wildpark-Circuit in Karlsruche, which had recently been declared forbidden as a racing circuit by German officials. It was used for Grand Prix motorcycle racing and as an automotive test track for Mercedes-Benz and Auto Union. In later years, it expanded to hosting venues such as DTM, Formula 2, and drag racing. It would host its first Formula One race in 1970 in an emergency switch from the Nurburgring Nordscheife, and would exclusively host the German Grand Prix from 1976 onwards until it began alternating with the new Nurburgring GP Circuit in 2006. Hockenhiemring used to look dramatically different from its current form, when it was modified and shortened in 2002 under demands from FIA officials. Track architect Hermann Tilke removed the route that ran through the forest and added new roads and chicanes to the track, changing the dynamic from long, high-speed roads to shorter, more handling-oriented roads. Roadsters like the ones we’re using never saw action at this course. But if it could prove itself challenging to German touring cars, it should be more than enough for Le Mans-style roadsters. The lap time to tune around for this week’s race is 2:00.150, and we will be running on the Hockenheim Full configuration. Please take plenty of time to familiarize yourself with the track and to tune your car. Also, please do not use the runoff area on the outside of turn one as part of your tuning or for the race. You might want to consider taking a look at ScorpioGTX1’s tuning guide for ideas on basic tuning. If you’re new and need info on this racing series, please read the series info thread. There’s plenty of time to join in and if you haven’t yet, message me here on Kinja or XBL (RoboRedMdn1te) and I’ll make sure you’re added to the invite list.